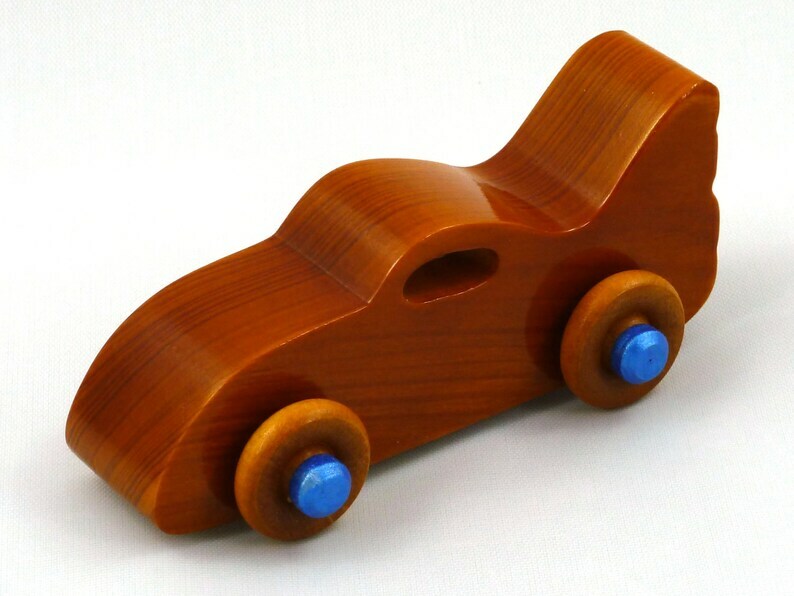 A small handmade wooden toy car made from solid wood for grown-ups and children over three. Sturdy, durable, pocket size and built to withstand a little boy's play. The small size easy for small hands carry with them or to keep in a busy bag. My grandson has a lot of these in various colors and finishes. He has been playing with them for over two years. They are still going strong, outlasting factory-made plastic toys. Like all my toys they are grandson tested and approved. A unique office decor or desktop fidget toy. With plenty of help from my grandson, we tested many ways of attaching wheel using the unscientific method of ramp races. The toy cars were rolled down a ramp to see which one went the fastest and rolled the longest distance. If you want a ramp to have races, please feel free to contact me. I can make these for you. Not intended for children under three or children who are still at that stage where they put everything in their mouth. It is not a teether. Custom orders are welcome. I can make these from Pine, Oak, Poplar, Plywood MDF and other materials. I can make these in different sizes. Painting is available in many colors. Please contact me for custom order pricing.